We helped feed local families in need by donating non-perishable items to our food pantry boxes. We hold drives during the winter holidays, and also in the summer when the need is even greater. We collected 112.8 pounds of food for Seeds of Hope. Bringing Hope Home is a non-profit organization that provides “Unexpected Amazingness” to families with cancer through financial and emotional support. In this particular event, we packed 33 gift bags for children with items that will help them while undergoing treatments with their physical needs as well as entertainment. Bring Hope Home also held an event in honor of Tim Anderson, a beloved friend, son and brother. At the age of 31 Tim was diagnosed with non-small cell lung cancer (NSCLC) with a rare anaplastic lymphoma kinase (ALK) gene mutation. In honor of Tim’s courageous life, The 31 Foundation was founded to assist those in our local Philadelphia-area community who are in need of a helping hand in various ways as it relates to cancer and beyond. SofterWare staff attended a fundraising event on May 12th at the American Helicopter Museum in West Chester, PA.
SofterWare folks dove into the pile of Sharpie markers to bring a smile and some encouragement to a child in need of a boost. The Sara’s Smiles Foundation brings hope, love, and most notably joy to children in hospitals around the country through Inspiration Kits. Inspiration Kits contain notes of encouragement on paper clouds, toys, and art supplies that give children suffering from illnesses happy experiences during difficult times. 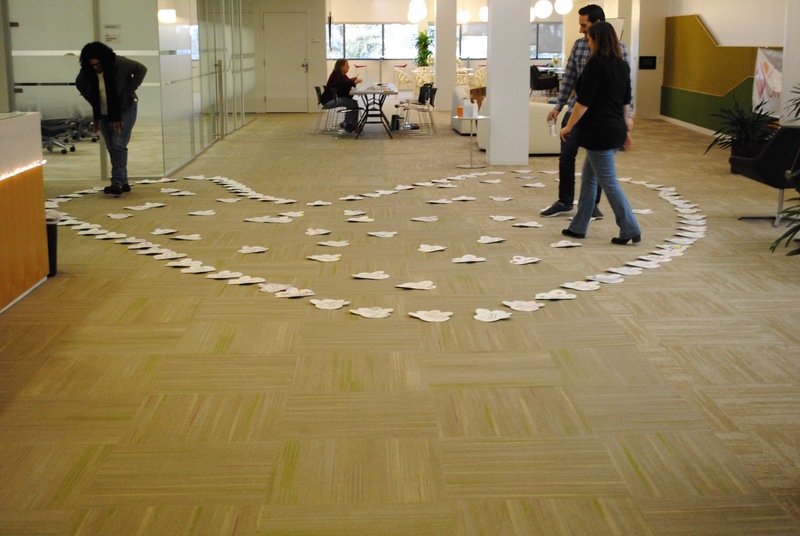 SofterWare employees used their creative skills to produce close to 150 clouds. Many folks joined together for a night of dinner, open bar, casino games, and tons of great prizes all available for you to win over 30 prizes! Their participation helped Sports Challenge Tournaments raise money for many great causes, including our own Jeff Pagano’s Play if Forward foundation. Family and friends of Anita Ramos-Rowe, wife of our own Paul Rowe, joined for our 3rd annual Walk MS event to support Anita! They raised $635 in the fight against MS.
What’s more important than bringing a little comfort or joy to a sick child? Nothing! 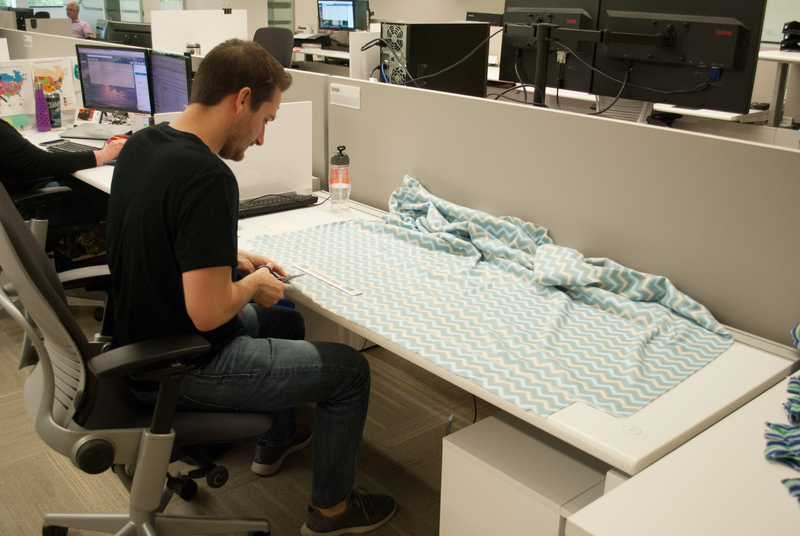 Many SofterWare folks took some time to make blankets for Project Linus to help a child who may be spending time in a sterile hospital room instead of home where they want to be. 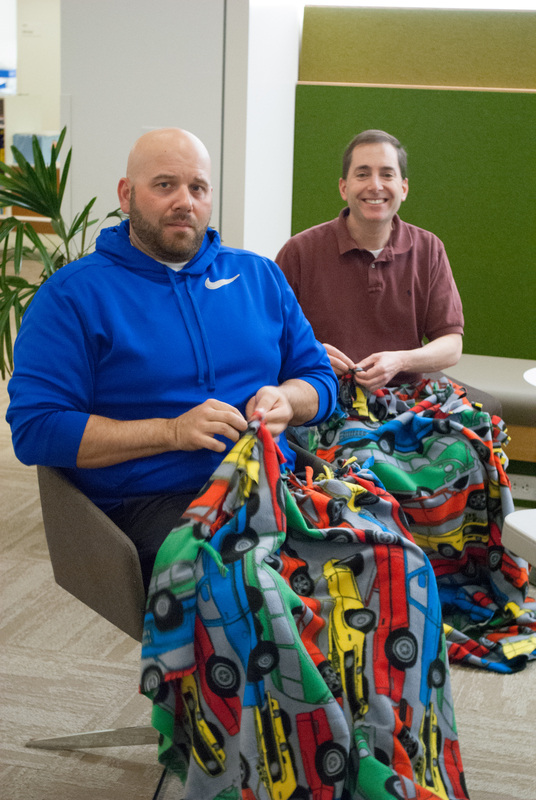 The blankets provide love, a sense of security, warmth and comfort to children who are seriously ill, traumatized, or otherwise in need through the gifts of new, handmade blankets, lovingly created by volunteer “blanketeers.” We created and donated 12 blankets! For those of less coordinated, it was a really challenging yet rewarding effort. The SofterWare green thumbs visited Pennypack Watershed to help them prepare for the summer season. Volunteers were asked to weed some of their field crops and berry beds, help with clean-up in their Edible Classroom for kids, and general garden clean-up of some of their entrances.. Many staff members have a great cause they support or an organization that is near and dear to their heart, so why not have SofterWare sponsor it? Each quarter, SofterWare holds a drawing – from entries submitted by staff members – for a $300 sponsorship for a charitable event or youth sports team. This quarter we chose: PA Wounded Warriors Inc.
SofterWare staff were encouraged to bring in a receipt to submit for matching gifts. As a bonus, not did we match their donation, we DOUBLED IT! So if they gave $50 to their favorite charity, SofterWare kicked in $100! As a result, SofterWare gave out over 7K in additional donations! On May 20, 2018, Absolute Music School hosted it’s 4th annual benefit to raise money for the PA Wounded Warriors, a local non-profit organization whose mission is to “restore wounded warriors to good physical, mental, and emotional health”. The event was held a the VFW in Warminster and raised over $8,000. There was live singing, food, and raffles. Thank you to everyone who participated. The YMCA isn’t just a Village People hit; it’s a valuable community resource center. It offers low-cost programming like camps, fitness center memberships, classes, and outdoor activities, too. SofterWare folks came out to lend a helping hand outside preparing the pool area for the new summer season at the Ambler YMCA. It was a great way to get outside, give back to the local community, and spend some quality team-building time. Aid for Friends’ meals and outreach services are provided free of charge to anyone who is in need, isolated and home-bound. 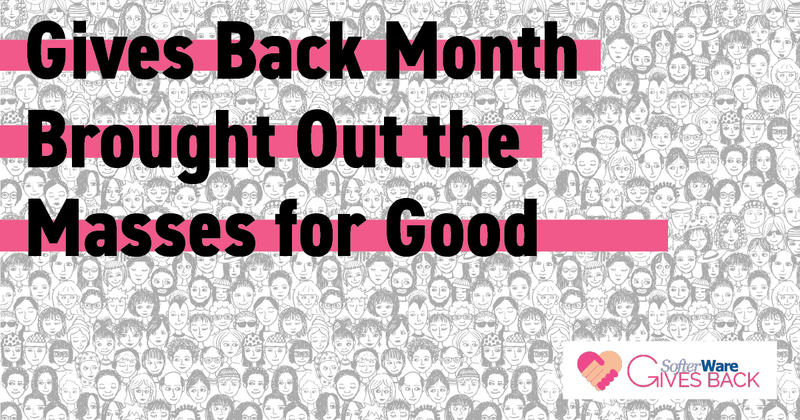 One of the many ways to help this worthwhile organization is to host a Group Cook Event at their commercial kitchen. 16 of us went to help make bacon and sausages for breakfast, prepare apple mixtures for pies and side items, big vats of chicken soup and lots of clean up. I must say, if you’ve never been in a walkin freezer, it’s quite an experience – instant winter!